This release is a typical "Essential" - release. Like all others there are some studio chat, some one liners, and a lot of humor. But for the first time we have a release that contains only unreleased stuff, 18 tracks in all. Impressive and a nice gesture to all music lovers, and especially to us "all-eating" Elvis fans. Is it as good as Essential Vol. 4?? Well, judge for yourself. I do think so, although this release does contains some substandard tracks, and Vol. 4 hardly did. Anyway, I like it just as much, and I hope and think you will too. This release is a jewel...in a jewelcase!! - Thank you, Ernst! This is take 1, and this version gives a good example of Elvis' feeling for music. Take 1, and it is close to perfect. 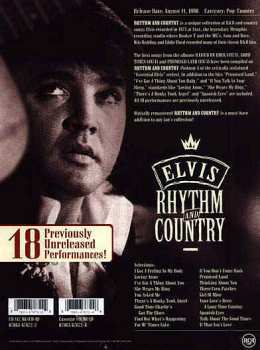 The rhythm and timing is good as master, though Elvis misses the lyrics sometimes. Elvis had a music "Feeling" In His Body. Really an impressive version. This song is underrated!! It is quality!! Elvis sings a little bit of Softly As I Leave You before this version. This is take 2, and it is not as good as master, still very good for an early take. It is a difficult song, and the way Elvis does it here is impressive after all. This is take 14, and you wonder where Elvis has been the other thirteen takes. He is completely way out of rhythm, and it is very strange that it would only take one more try to create a master. Cool to have an out-take of this song, but it is not a masterpiece. Starts out with some gentle guitar-playing from Elvis (?). I really like this because it gives a unique feeling of being there where it happened. After a while, take 8 begins. This version is more careful than master and I simply love this one. BEAUTIFUL!! This is only a try out version. Not even a single moment could this version be considered as a proper take. Loose as no tomorrow. Better as the song goes along. A shaky version. This is take 1 and Elvis seems to be uncomfortable with this song. He goes up now and then, but can't make up his mind of how it should be. We all know that seven takes later it would be perfect. Nice to have this version. This is the version just before master, and it is very similar. Perhaps more like the live version he did on August 19 1974 in Las Vegas, as found on bootleg. Also very close to master. Some phrases from mr "deepvoice" not heard on that one. Better sound than on "Raised On Rock". In fact I have always liked this song. It is a somewhat untypical Elvis song. It is said that Elvis was in a quite good mood the day he recorded this one, compared to the other days of this session. I think Elvis meant every word of this song. A tearjerking performance. Quite similar to the released version. Elvis sings Surrender in a Mario Lanza style before this take. I really have doubts about this being right before this take or even at this session, because Elvis seems to be in a very good mood and we have always heard that Elvis was in a lousy mood on the July session. Take 3 of this version don't differ very much from original, although the timing is a little different on the ".. and take this crazy man away". This version is in fact much more close to master take than take 5 (released on Platinum). I think this version is smoother than the other out-take, and it is very good. The sound on this take has been mixed quite different than the other takes of this song. This version is the shorter than master. Elvis sings this song with a mood fitting better to the lyrics. I think this version is a tad better than the master take. Also some nice piano, not heard on master. Same for this song. What a complete waste of talent! The sound is also one of the lowest standard I have heard, though better here than on the take from Raised On Rock. We can read in the great book of Ernst, that before Elvis recorded this song, someone had stolen his microphone. Jarvis replaced it with what they had available, a very cheap microphone. When Elvis eventually found out this he left the studio. The session was definitive over..! This song has never left any special impression on me. It is a typical "middle on the road" song, and therefor I couldn't spot any differences on this version. Perhaps it is a tiny little bit better than the master take..
Starts with Spanish counting, but then before anything happens English counting is needed. This version is very good. Elvis must have loved this kind of music. It is brilliant. Better sound than on 'Good Times'. Starts out with Elvis singing some lines from Farther Along, and another one I don't know. This version is very loose. Some very cool piano playing, and I really dig this version. Eventually it falls totally apart, so it couldn't be a master take. Note: (Take 7 has been released on Easter Special).